You can help your little ones dress up as a veterinarian for a party, job fair day at school or just imaginative play. Make your own lab coat, stethoscope and ID badge for this fun costume. 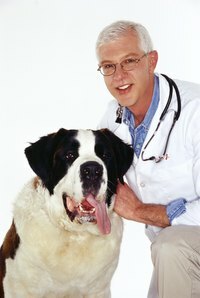 A cute stuffed animal to carry around helps round out the look of a vet. Go online to a badge-maker website. There are many sites where you can create fun, fake badges for party costumes. Fill in the required information for your veterinarian badge. You will need to enter the name, job title, badge purpose and upload a small photo to use on the badge. Print and cut out the badge from a piece of paper. Slide it into the clip-on luggage tag. Cut the wire off of an old or inexpensive pair of headphones. Glue or tape the end of the cable sleeve to the middle of the headband on the headphones. Glue or tape the plastic bottle cap to the other end of the cable sleeve. You might want to cut two short slits into opposing sides of the cable sleeve. Slide the bottle cap horizontally into the cable sleeve via the slits. Tape around the bottle cap to secure. Paint the entire stethoscope in black paint. If parts of it are already black, you do not need to paint those areas. You can also use chrome spray paint to paint it all in a metallic silver color to look more like a real metal stethoscope. Allow the paint to dry. When your child wears the stethoscope, the headphones should hang upside down from the neck. Cut the cuffs and forearms off of the white button-up shirt. Cut around the bottom of the shirt so that it is completely straight all around. When worn like this, the shirt should look like a lab coat.